The stage is set for the launch of Lingayen as the Beach Sports Capital of the Philippines. Be part of this momentous occasion which will happen at the Capitol Beach Front, Lingayen, Pangasinan. Festivities warm up with the sports clinics for sports enthusiasts and trainers today October 27. 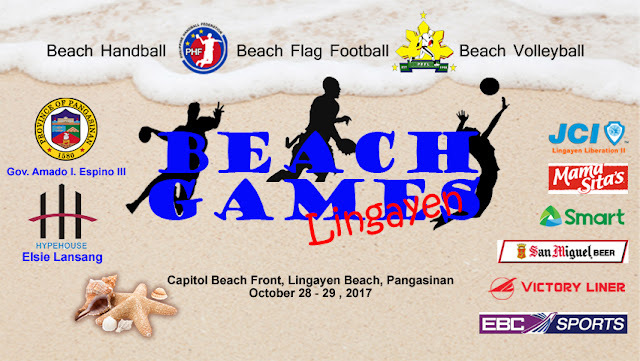 Then it will be an action packed weekend on October 28 and 29 as the vast Lingayen Beach will be booming with live action from three different sports; Asian Inter-Collegiate Beach Flag Football Tournament, Beach Handball exhibition matches; Corporate and Collegiate Beach Volleyball Cups. And when it gets dark, action will shift from the playing fields to the entertainment grounds. Athletes, spectators, and tourists will be treated with three nights of fun and surprises at the Capitol Beach Front Open Field. There will be a welcome night party tonight, an opening night on the 28th, and awards night on the 29th. This is an event you surely wouldn't want to miss. So come and see us in Lingayen.